Discussion in 'More Freshwater Aquarium Topics' started by shookyjr, Apr 20, 2017. Hi! My 10yo son has apparently not been keeping up with his tank maintenance. This morning he found these guys on the glass. They are tiny (<1mm) and white. Some have two little sacs on the end, but most are translucent wormy looking things. 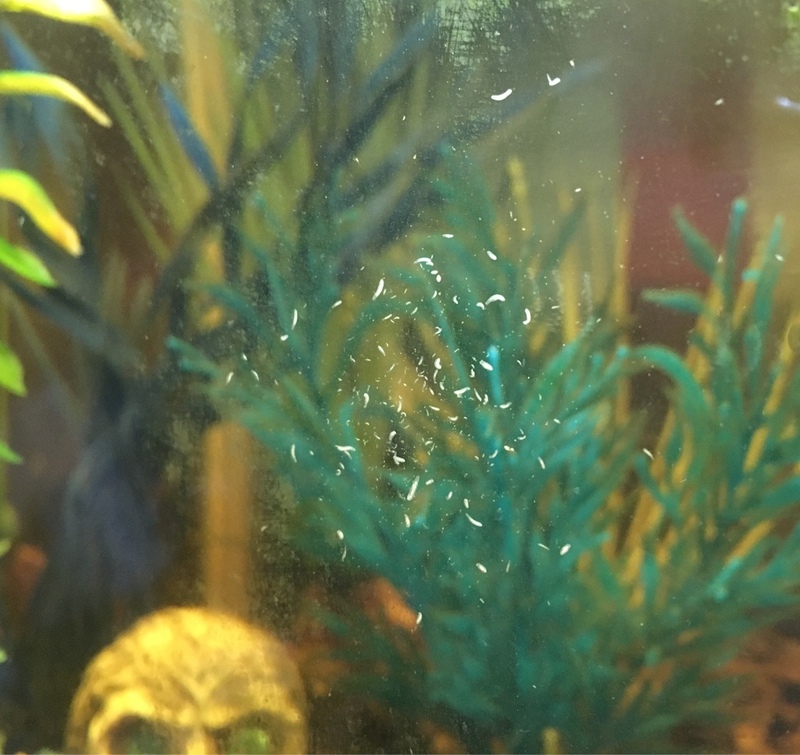 I've been searching and think they may be copepods? If so, are they harmless? I tested his water, which along with the algae on the glass belies his claims of regular water changes, lol. 6.2 pH (our norm is 7.4), NH3 0, Nitrate 40, Nitrite 0, temp 73. It's a 10 gal tank with gravel, driftwood, and artificial plants. Its sole inhabitant is an electric blue crayfish who eats a combination of blood worms, brine shrimp, flakes, and pellets. Separately, does anyone know if anything can coexist with the cray? My son is wishing for a snail but I have a feeling that would be lunch. For now I am guessing gravel vac and water change? Should I try to eliminate the wormies? TIA! I believe those are Detritus Worms. I'm not 100% sure on whether they are harmful or how to get rid of them but a gravel vac and water change are always a good start IMO. As for Crayfish tank mates - anything he can catch he will probably eat. 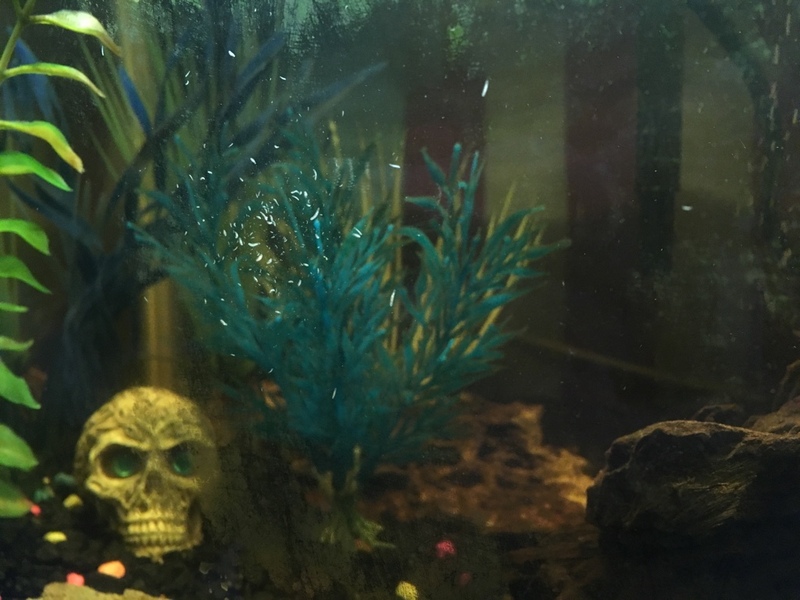 A snail might be OK - I've never had mine mess with any of my mystery snails or otherwise. As for fish I would choose something that is fast without flowing fins and likes to swim in the top portion of the aquarium. That being said, unless your crayfish is a dwarf crayfish he really should be in a larger (at least 20 gallon but I recommend 30-50) tank so adding more tank mates might not be the best idea right now. Crayfish are really messy eaters and tend to hide food places which can cause water issues in any tank but remember - the smaller the tank the harder to maintain good water quality. Hopefully you can upgrade him soon, good luck with everything!!! Eeeek, I don't think he is supposed to get big - LFS told us 5-6". But then again, they said the 10 gal was okay, lol. This is him. We have had him 5 months. He has molted twice and grown about an inch. What do you think? Thanks for your response! My son is doing a water change now. We have a mystery snail outbreak in our main tank, so maybe we will try one in with the crayfish. Well, dang! LOL looks like an upgrade is in his future! You should read the thread @The Crayfish King has about his crayfish named Simon. He's a hoot! From what I've read on there, Simon really likes to eat snails. I don't know if they could eat a mystery snail but he does eat pest snails. There is a really funny photoshoped picture of Simon and his cohort in a pest removal van. Question Will Freshwater Fish Eat Copepods?